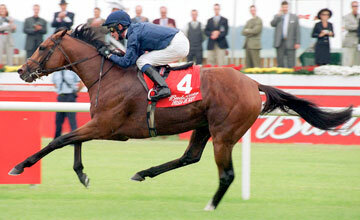 Galileo Was foaled on the 30th March 1998. 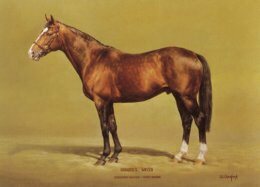 He stands at 16 1/2 hands (64.5 inches) A bay horse with a narrow white blaze. He was sired by Sadler’s Wells out of the mare Urban Sea. His breeders were David Tsui, the owner of Urban Sea, and Orpendale, a name used by the Coolmore Stud organisation for some of their breeding interests. He was described as a three-year-old as being, one of the most impeccably bred horses in training. Owned by John Magnier and Michael Tabor, he was sent into training by Aidan O’Brien at Ballydoyle and was ridden by Mick Kinane in seven of his eight races. Galileo did not make his racecourse debut until 28th October 2000 at Leopardstown. He was the even-money favourite, and beat his fifteen rivals by fourteen lengths. Galileo’s next start was as a three year old, again at Leopardstown in April. In the Ballysax, he was sent off odds-on favourite, and duly obliged by three and a half lengths. Back in third in that race was Vinnie Roe who went on to win four Irish St Legers. Galileo had his third race at Leopardstown in May as he was stepped up in class for the Group Three Derrinstown stud Derby trial. 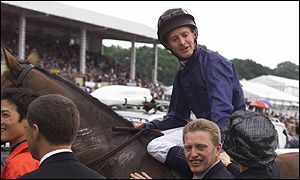 He was made odds-on favourite, and was ridden for the first and only time by Seamie Heffernan, as Mick Kinane was riding Milan in the Group One Prix Lupin on the same day. He won the race by one and a half lengths, and was made a 5/1 chance for the Derby. 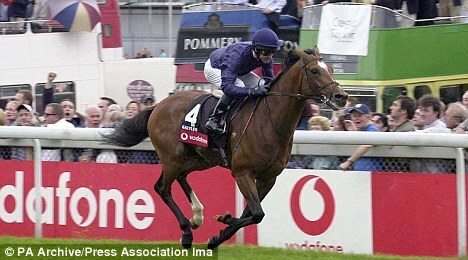 On Epsom Derby day, Galileo started 11/4 joint-favourite alongside the 2000 Guineas winner Golan. Among the strong field was,Tobougg, the previous year's champion two year old, and the winners of major Derby trials, including Mr Combustible (Chester Vase), Dilshaan (Dante Stakes) and Perfect Sunday (Lingfield Derby Trial). Two furlongs from the finish, Galileo moved past Mr Combustible and quickly went clear to record an impressive three and a half length victory over Golan. Following the race, timeform assigned a figure of 130 to Galileo, making him, in their opinion, the best Derby winner for ten years. Kinane was reported to have called Galileo the best horse he had ridden, saying, there is no weakness to him. He is a dream to ride. 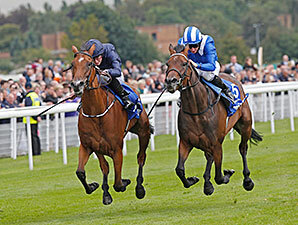 In July, Galileo’s next race was against older horses in the King George and Queen Elizabeth Diamond Stakes. The betting suggested that the race would be a match between Galileo the 1/2 favourite, and the Godolphin owned five year-old Fantastic Light at 7/2, who had won Group One races in four different countries. Such were the reputations of these two horses that the third choice in the betting, the French Derby winner Anabaa Blue, started at 18/1. Two furlongs out, Galileo and Fantastic Light raced together for a few strides before Galileo pulled ahead inside the final furlong and won by two lengths. Marcus Townend, writing in the Daily Mail, described Galileo as the best horse in Europe and praised his determination and lightning acceleration. For his final race, Galileo was sent to Belmont Park for the Breeders Cup Classic. He was racing on dirt for the first time, although before travelling he was prepared by exercising on the artificial surface at Southwell. The Classic was expected to feature a third meeting between Galileo and Fantastic Light, but the Godolphin horse was switched to the Turf shortly before the race. In the Classic, Galileo raced behind the leaders for most of the way but was unable to quicken, staying on at the same pace to finish sixth of the fourteen runners behind Tiznow. Galileo's retirement was announced immediately after the race. At The Curragh, three weeks later, Galileo was made favourite at odds of 4/11, for the Irish Derby. Galileo led two furlongs from the finish and quickly went clear. Although Kinane eased him down in the closing stages, he won by four lengths from the Italian Derby winner Morshdi. Kinane, said that he was always in complete control, while Morshdi's jockey, Philip Robinson described the winner as a freak. Irish Champion Stakes In September, Galileo returned to Leopardstown where he was unbeaten in three races. He was matched against Fantastic Light again, this time over the shorter distance of one and a quarter miles. Fantastic Light took the lead two furlongs out, and Mick Kinane immediately moved Galileo up to join him. The two horses raced side by side throughout the last two furlongs, with the advantage appearing to fluctuate between them. On the line, Fantastic Light defeated Galileo by a head in a photo finish. The race has been described as one of the most exciting and memorable in the modern history of the sport. Galileo was named European Champion Three-Year-Old at the Cartier Racing Awards. 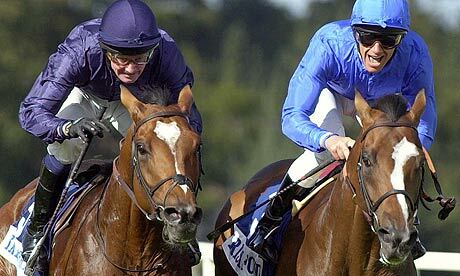 In the 2001 International Classification, Galileo was assessed at 129, making him the third highest rated horse behind Sakhee and Point Given. Galileo was given a final Timeform rating of 134. Achievements happen naturally in Galileo’s world, and in this years Epsom Derby Galileo’s Classic tally was strengthened when Australia became his third winner of the Epsom Derby following New Approach and Ruler Of The World. As a result, his progeny earnings for the year in Britain and Ireland have already reached nearly £6 million, almost £4 million ahead of his nearest rival, Invincible Spirit. Galileo’s juveniles this season could be the best ever. too name just a few. John F Kennedy (Group 3) winner, and yet to race, Giovanni Canaletto, Sir Isaac Newton, and prospector. With his daughters who have yet to race. Fluff, Truth, Kissed By Angels and Diamond Bangle. 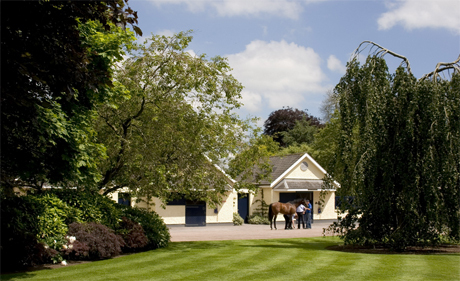 Galileo was retired to stand as a stallion for the Coolmore Stud. Having won leading sire in Great Britain and Ireland for five of the past six years, and well on his way to doing so again this year. 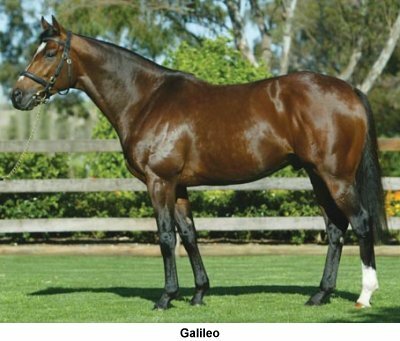 Galileo is firmly established as a super sire of racehorses in Europe. It is a dominance that has been unrelenting since his first crop turned 3 in 2006, the year that Galileo accounted for Irish 1,000 Guineas heroine Nightime and the first three home, Sixties Icon, The Last Drop, and Red Rocks. In the St Leger. Champions, such as Frankel, New Approach, Teofilo, and Australia have followed since then, and this year in the Irish 1,000 Guineas, a notable milestone was reached when Marvellous became his 100th Group stakes winner. Already beating his best season in 2012, when his earnings totalled nearly £5.8 million. With Australia and Marvellous as well as Noble Mission, Telescope and Yorkshire Oaks winner Tapestry among his representatives this season. So much still to look forward to. With more to come for many more seasons. Updates will be of more record breaking feats by this super stallion, and wouldn’t his father Sadler’s Wells be so very proud.